The statistics shown below are what is available by end of Feb 2013. The number of deaf people who made their appearance from 1788 to 1920 in Australia, regardless whether they were born, arrived or whatever. To make it clear, no person was counted twice. It is possible there would be more out there – we’d need to find them! To make this more interesting and complicated, I am adding the years the epidemics Australia had as they could have impacted on the number of deaf population. Overall, the general assumption that 10 percent of the country population would include deaf people does not really applies to Australia at this stage. That Robert Yeomans (Robinson) was the first recorded deaf person (in non-aboriginal history) to be born in Australia! He was a son of a convict (Mary Cassidy from Ireland, per ‘Kitty’ 1792 with 7 yrs sentence) and seaman (Robert Robinson), born on 9 December 1792 in Sydney Cove, New Holland (Australia) a month after his parents’ arrival! After Robert Snr left the Colony, his mother Mary married a William Crew, another convict and they added 2 girls to the family before William’s death in 1797. Robert Jnr gained another stepfather when Mary married John Yeomans (convict, per ‘Britannia’ with 7 yrs sentence) and this one was for the keeps! John and Mary went on to build their family with eight more children, moved from Sydney Cove and Concord before making the final move to Wilberforce when Robert was 9 years old. Robert was working as a shoemaker by 1823, living at Wilberforce with his family. Five years later, Robert had his own property – a 60 acres with cattle and crops growing. He also ran his own shoemaking business in Wilberforce, and probably in Windsor. He died a bachelor on 9 June 1856, aged 64 years. Did it say Robert was a shoemaker, a businessman, and a farmer? Yes! Even in the early 1800s! There are documents on Robert Yeomans, however only three used here as examples: Musters (censuses), family diary and notes, and newspaper notices. 1823-1825 General Muster List of NSW: Yeomans, Robert, aged 27 years, born in the Colony, dumb and living at Wilberforce. 1828 Census of NSW: Yeomans, Robert, aged 36, born in the Colony, a Presbyterian and a shoemaker at Wilberforce. Owned a 60 acres with 10 cattle. “(Robert)… was deaf & dumb from infancy had learnt the trade of Shoe-making of which he continued to work until a few weeks before his death. He was remarkably intelligent, could write tolerably well, was always cheerful & happy and possessed an excellent memory. Was a great favourite with all the inhabitants of Wilberforce where he had resided from boyhood…” – dated in the year of Robert’s death. 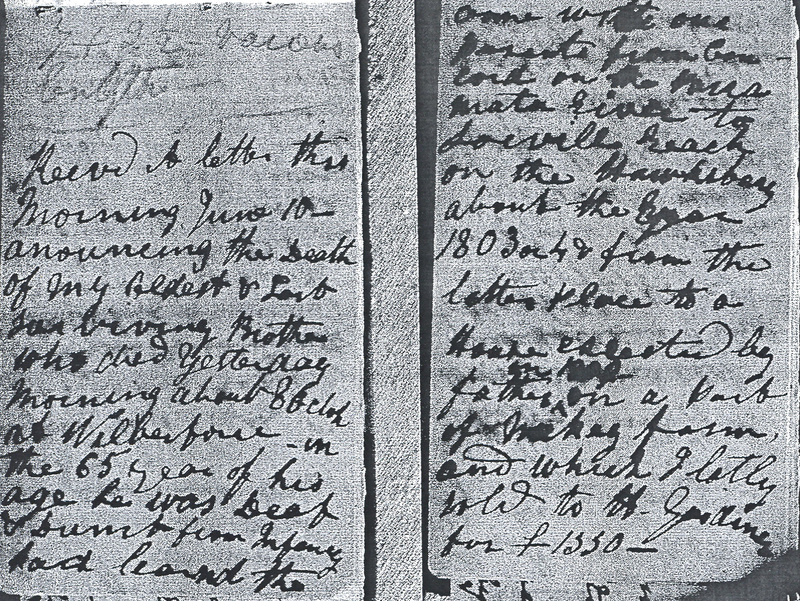 A photocopied pages – the mention of Robert’s death and who he was. “…was accepted by John, as his Step-son. He was born a deaf mute and remained under the family’s wing most of his life. He had learnt the trade of shoe making and repairing and set up a repair business in Wilberforce, which he continued right up to his last few weeks of life. … His property at Kurrajong, 60 acres adjoining George’s, (… which was a memorial granted to his father and deeded to Robert) was worked by himself and his brothers up until his death, when it was absorbed back into the estate being controlled by John Jun. at that time. Kurrajong is about 15kms West from Wilberforce. George was one of Robert’s half-brothers. Memorial grant was a land grant given by the government of the time to people who requested for some to support themselves. John Snr petitioned that he need more support to assist his deaf and dumb son Robert and idiot daughter Charlotte and he was granted over 100 acres land at Wilberforce area which included Kurrajong. Part of this land was then divided and Robert obtained 60 acres. Dropsy = An old term for the swelling of soft tissues due to the accumulation of excess water. In years gone by, a person might have been said to have dropsy. Today one would be more descriptive and specify the cause. Thus, the person might have edema due to congestive heart failure. There is no marked headstone at St. John’s Cemetery of the Yeomans family last time visited in 2010. The cemetery experienced numerous vandals, floods and damages so it is possible the particular headstone’s missing. ‘Sydney Gazette & N.S.W. Advertiser’ dated 25 August 1821 (p. 2, col. 2) – A public notice from Surveyor General’s Office, Sydney – a list of persons for the grants and leases. Robert was listed for a grant, along with his brother George. ‘Sydney Gazette & N.S.W. Advertiser’ dated 27 August 1833 (p. 3, col. 6) – Robert was listed as one of the donor for the ‘Hibernia Subscription Fund’, donating £0, 2, 6., from Pitt Town. ‘The Sydney Morning Herald’ dated 22 March 1855 (p. 2, col. 3) – Robert donated £0, 5, 0. to the Patriotic Fund, collected at Wilberforce.
? Why was Robert trained as a shoemaker?
? Who taught him to write?
? Did Robert travel around and to Sydney?
? Was he aware of other deaf people (there were about known 20 deaf people before his death)?
? What else would we be able to find out about him? Snippets from emails and notes on the history of Yeomans family. Welcome to Deaf History Australia blog. This blog will cover as much as possible on deaf individuals, events and organisations relating to deaf people in Australia from 1788 to 1950. It is a combination of educating, inspiring and encouraging you and others to explore further on the history of deaf community in Australia, regardless of how deaf you or others are. Please do contribute, comment or give support in ways you are capable to keep this blog going.